Direct Metals supplies bar grating products that can be used for a variety of applications. Bar grating is an ideal choice for projects ranging from trenches and stair treads to decking and steel flooring. Used as metal grates, bar grating covers open areas in flooring that require light, liquid, air, heat, and sound to pass between flooring levels. Product versatility and strength is why many industrial companies use our bar grating as floor grating. Companies use our serrated carbon steel bar grating to provide extra grip on surfaces for walking. Our TiteWeld™ bar grating is also commonly used to make it possible for maximum “roll-a-bility” when a wheelchair, hand truck or cart is in use. With one of the largest specialty metals and fiberglass product suppliers in the nation, Direct Metals has the bar grating to fulfill your floor grating or surface needs. 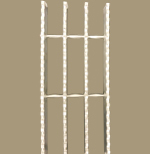 Bar grating is available in materials such as aluminum and various types of steel grating. Direct Metals carries a full bar grating product line to meet the needs of their customers. Stainless Steel Bar Grating provides a superior corrosion and oxidation resistant material that is stronger than aluminum. Available in both smooth and serrated surfaces. 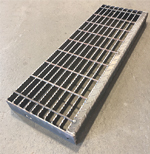 Carbon Steel Bar Grating is an ideal option when your project requires a strong material that will not be exposed to an expressly corrosive environment. Direct Metals supplies both smooth and serrated bar grating. Bar gating is available in galvanized, painted black, plain steel, light duty, and heavy duty. Aluminum Bar Grating is a strong choice when lightweight, corrosion resistant material is desired. 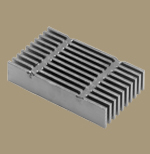 There are many aluminum bar grating options, such as flush top, rectangular bar, plank, and I-bar. 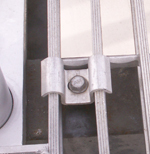 Direct Metals supplies aluminum bar grating in the swage locked, pressure locked (dove tail), and riveted designs. Bar Grating Stair Treads are offered in a welded construction and is made with a nosing that is welded to the leading edge of the tread. End plates can be welded to the ends of the treads to mechanically fasten to stair stringer channels. Stair treads come in both plain and serrated styles. 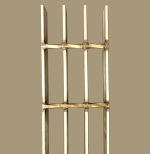 Architectural Bar Grating is designed for industrial and architectural applications. 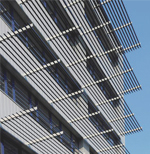 It is ideal for projects ranging from sunshades, fencing, building facades, walkways, ornamental grilles or any bar grating project that requires visual appeal. Anchoring Devices attach the bar grating to its supports. Direct Metals offers saddle clips, anchor blocks, plank clips, countersunk lands, grating clamps, Z clips, and plank lugs for bar grating projects. 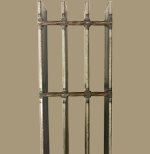 Many of these bar grating anchoring devices are available in aluminum, stainless steel, and galvanized steel.